I first tried this perfume a couple of years ago, and my immediate impression was that it was very similar to Estée Lauder White Linen. Both creations offer a strong aldehyde experience. In fact, I'd go so far as to say that the aldehydes really dominate these compositions. There are lots of other participants, but the aldehydes steal the show to the point where I have to be in a certain type of mood to wear this sort of perfume. In some ways I hate to admit this, because so many people gush over Gold, but to my nose, White Linen extrait is a more appealing perfume. I somehow get that weird buzz which appears to scintillate the central nervous system of devotees of Chanel no 5. Everyone needs to have that essential life-transforming aldehyde experience with one perfume, but which one it will be varies from person to person. Chanel no 5 never really did it for me, but White Linen extrait did--once. Alas, I was never able to repeat the experience, and was a tad disappointed when I acquired a bottle of the eau de parfum and found it to have a fuzzier oak moss quality rather than the white Dial soap clarity-inducing zing. In my initial testing of the made for women perfumes from this house I found Amouage Dia to be even more intensely aldehydic, or perhaps with fewer base notes than Gold, so I did end up preferring Gold to Dia, but if the truth be told, I was not enamored of either. Trying Gold again a couple of days ago, I realized that I still find the aldehyde a bit overdosed to the point of shrouding the flowers. I wonder whether the same mistake was made in this case as was made with Chanel no 5? Legend has it that the mixer added five times more aldehydes than prescribed by the formula. But that was what Gabrielle selected, and the rest is history. I was happy finally to give Gold for guys a sniff, in honor of Vladimir Putin's recent valiant attempt to avert World War III. It is rumored throughout the world wide web that Vlad's signature scent is Amouage Gold pour Homme, so that was reason enough for me to pull out my carded sample. What I found, to my surprise, was a perfume rather close to Van Cleef & Arpels First! The first clue was the heavy civet. But the blended florals are really beautiful in Gold pour Homme as well. 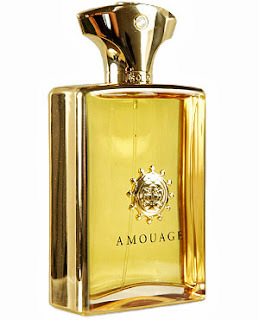 In fact, upon reading a review by jtd it dawned on me that Amouage Gold pour Homme is like First without aldehydes, and Amouage Gold pour Femme is an aldehyde bomb, so First is basically the equivalent of a cross between Gold pour Homme and Gold pour Femme! My favorite of the three is Van Cleef & Arpels First. But First is not in the running today. 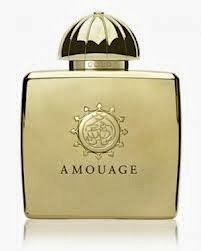 Amouage Gold pour Homme is a better perfume than Gold pour Femme, in my opinion. It's more complex and not marred by the aldehyde overkill of Gold pour Femme. In fact, when I wore it the other day I was forced to postpone my bath because I couldn't bear washing it away! Some of my perfume pals do not like Gold pour Homme. Perhaps they find the civet too heavy. I, in contrast, find it to be an excellent perfume--for guys and gals alike! Yes, it's old school, in some sense, but it's also a welcome blast from the past in this age of abstraction and Twitter perfumery. I've been finding that nearly all of the Amouage pour Homme perfumes are highly wearable by me, and in several cases I prefer the Homme to the Femme. Gold is no exception to the rule!